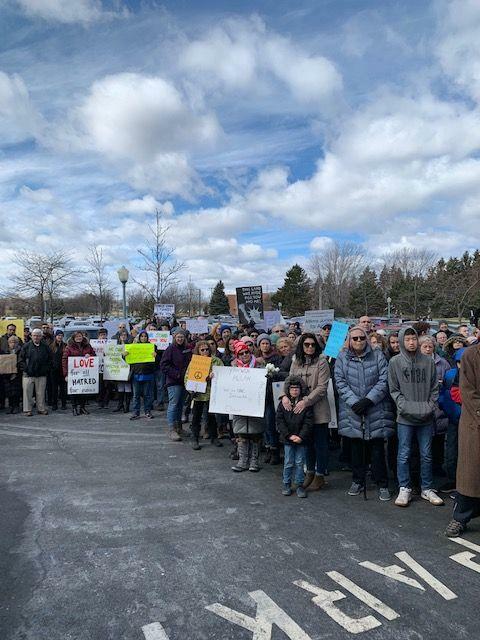 In the wake of the New Zealand terrorist attacks that took place at two mosques last week, killing 50 people, and injuring 50 more, hundreds people of various faiths, cultures and racial identities gathered outside of the Islamic Center of Rochester on Sunday afternoon. The event was organized by the Levine Center to End Hate and the Jewish Federation of Greater Rochester. Participants were encouraged to bring signs with messages of love and support. Kristi Reich, her husband and two children came out to the event on a chilly March day. "Somebody has a sign that says, 'We will stand watch while you pray.' And I thought, 'that's so powerful' because I'm not a person who prays, but we live in a nation where that's supposed to be a fundamental right, and I think it's important that if that right is not being freely allowed, that we all stand and we say, 'not on our watch,'" Reich told WXXI News. Fabeha Fazel is a worshiper at the Islamic Center. She says that seeing the large crowd of supporters makes her emotional. "This is beautiful, this I would say an emotional moment for me honestly, I never seen such things before," Fazel said. "In times like this, whatever is going on … this is a representation that all of us are good and we want peace and we want to love each other and we want to be there for each other." The President of the Islamic Center, Tabassam Javed, says that the support shows that the local community has an understanding of what the Islamic religion is about. "These are the people who know that Islam is a religion of peace. These are the people who have firsthand knowledge of what the faith is about. They don't have to go to an internet chatroom to hear the hate and have that spewed at them and then make their opinion." On their Facebook page, the Jewish Federation of Greater Rochester said that its members would stand outside the mosque in Brighton to greet worshippers as they enter and, "let them know that they are not alone, that we are a community that values diversity and celebrates difference, and that we will not tolerate any form of hate." 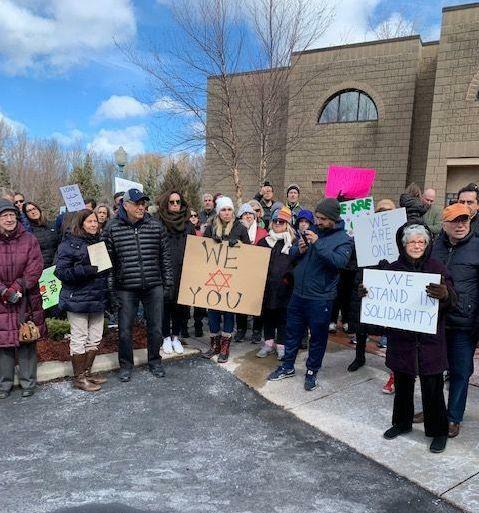 The Louis S. Wolk JCC of Greater Rochester had a similar message on its Facebook page, stating that the Jewish community "is deeply saddened" by the attacks in New Zealand and it also asked its members to bring handmade signs with messages of love and support.